While the iPad and Nook may seem like devices more appropriate for your teenager rather than your elderly mother, more and more seniors are finding e-readers and tablets to be useful devices rather than unnecessary technology. 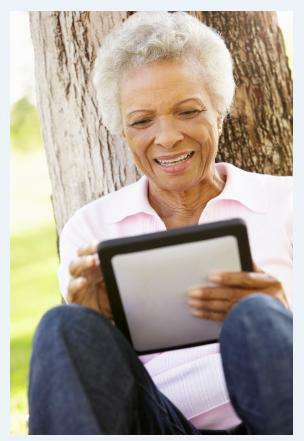 A recent article in the Florida-based Sun Sentinel highlighted the growing prevalence of e-reader use amongst seniors, noted that the Pew Research Center released statistics showing that e-reader and tablet use amongst individuals aged 50 and older nearly doubled during the 2011-12 holiday season. However, beyond statistical findings, real world applications are being noticed by people who work with seniors in a variety of setting. Kami Barett, who teaches as part of a life -long learning program at Florida Atlantic University reports seeing an increasing number of seniors (who always show up early to get a good seat) browsing e-readers and tablets as they wait for class to start. With more and more seniors, using tablet and e-reader devices, the uses for the technology is also expanding. While mobile devices are fantastic tools for entertainment, they can also play a vital role in managing the care of a spouse or other elderly loved one – making tablets a double-duty device. The ability of tablet devices like the iPad and Kindle Fire expands far beyond their abilities as an e-reader. For seniors aging in their own homes and requiring the assistance of caregivers from a home care agency, the device can be used for caregivers to clock-in and out, as well as task track completion within a homecare software or homecare system, such as ClearCare. Additionally, for seniors whose spouse requires care, a tablet can be used to securely log into a homecare software or homecare system and view real-time updates on their loved ones condition; all while they’re on the go, and all via a device that is large enough that it’s easy and navigate and read. No matter what a senior’s personal situation is, a tablet or e-reader can offer entertainment via music, games, and books while also offering easy access to care management when used in conjunction with an elder care agency that utilizes a homecare software or homecare system. For example, homebound seniors can use the tablet for connecting with the world via the internet, downloading new books at the touch of a screen and monitoring their upcoming caregiver schedules via a homecare software or homecare system log-in. Likewise, seniors who enjoy travelling can keep their books all in one easy-to-carry place, as well as manage the care of other elderly loved ones with ease! No more is technology just for the young; it’s also a useful tool for the young-at-heart, and with the help of a robust homecare software or homecare system, such as ClearCare, it can double as entertainment and a handy care management tool.